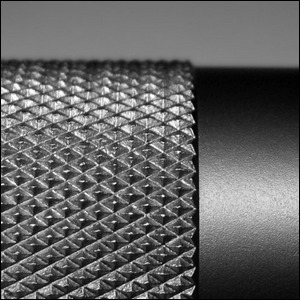 The Diamond Grip Pattern Frequently Found On Metal Tools Is Called? Even if you never knew it had a name, you’ve likely encountered it many times before. Knurl is found on everything from the handles of tools to the foot pegs on BMX bikes, and even on the barrels of some mechanical pencils. Knurl—the k is silent and “nurl” rhymes with “curl” if you’re curious about the pronunciation—is a pattern of lines or a criss-cross pattern of ridges or indentations rolled, pressed, or cut into a surface (typically on metal objects) to make it easier to grip and use the object with bare or gloved hands. The most common pattern is the diamond pattern wherein the end result, seen here, is a pattern of tiny pyramidal diamond protrusions on the object. The word comes to us by way of the Middle English word “knar” or “knot in wood”. Interestingly, while the word “knar” vanished, it left behind a variant, “gnarl”, which we still use to this day to describe rough and knotty protuberances on trees.